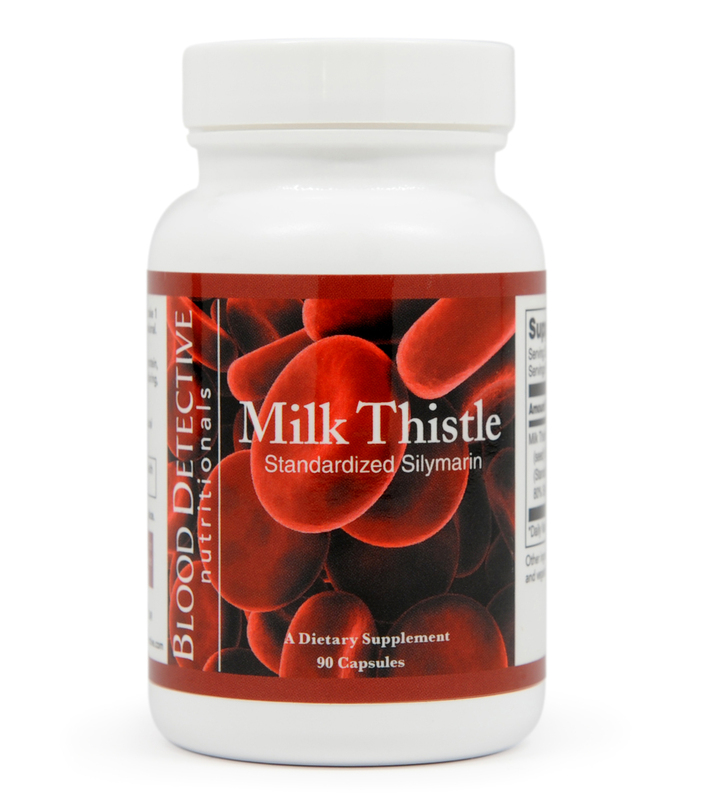 Milk Thistle (Standardized Silymarin) capsules, provided by Blood DetectiveTM Nutritionals, contain 150 mg of milk thistle extract, standardized to contain a minimum of 80% of the flavonoid silymarin (120mg). Milk Thistle (Standardized Silymarin) capsules, provided by Blood DetectiveTM Nutritionals, contain 150 mg of milk thistle extract, standardized to contain a minimum of 80% of the fl avonoid silymarin (120mg). Milk thistle, a common herb native to the Mediterranean, has been widely used for its nutritional support of liver function for over 2,000 years. Seeds of the dried milk thistle fl ower are rich in silymarin, a biofl avonoid complex of three fl avonolignins: silybin, silydianin, and silychristin. Silymarin is responsible for milk thistle’s powerful protective and regenerative activities in the liver. radicals can damage the cell structure and interfere with normal cell functions. Fortunately, silymarin provides support for free radical damage. Furthermore, silymarin enhances levels of glutathione and superoxide dismutase, two primary antioxidants in the liver. In addition to its protective functions, silymarin stimulates damaged liver cells to regenerate. In the cell nucleus, silymarin augments the production of ribosomes, stimulating protein synthesis in the damaged cell. This results in expedited cell regeneration, the replacement and repair of damaged cells. Milk Thistle capsules may be a useful nutritional supplement for individuals who wish to enhance healthy hepatic function through the natural protective and regenerative properties of this herb.